We have entered into an entirely new era, an age of increasingly frequent and intense periods of turbulence in the global economy. Unlike past recessions, today’s crises have precipitated a need for businesses to develop a new mindset, one that takes into account intermittent periods of disturbance, allowing them to thrive while under the constant threat of chaos. 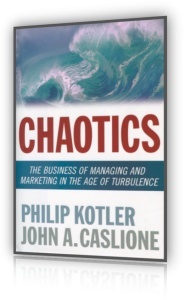 Complete with metrics and measurements, “Chaotics” outlines a powerful new system for managing waves of uncertainty affecting customers, employees, and other stakeholders. In this climate of increased turbulence, no organization can survive with less. 2. Do your investments change your customers’ buying behavior? 3. Are your investments focused on customers’ barriers to buying your brand? 4. Do you have the right mix of marketing levers among your investments? When the U.S. financial meltdown struck in 2008, with the seeds laid much earlier, we were asked by our clients and friends, “How deep will it be? They wanted to know if it would be a short-run recession, a deep recession, or even a great depression. When asked the same question in October 2008, Gary Becker, the Nobel Prize-winning economist, said, “Nobody knows. The message: Don’t trust economists who say they know. The fact is that we are entering a new age of turbulence, and moreover, heightened turbulence. In his book The Age of Turbulence (Penguin Press, 2007), Alan Greenspan describes his diverse experience as the Federal Reserve chairman and one of the most powerful men in the world. Greenspan had to deal with a great number of economic disturbances and shocks for which the only recourse was to muddle through and pray. He was confronted with major issues facing the United States, such as burgeoning trade deficits and retirement funding, as well as the proper role of government regulation. The world is more interconnected and interdependent than ever before. Globalization and technology are the two main forces that helped create a new level of interlocking fragility in the world economy. Globalization means that producers in one country are increasingly importing resources from other countries and increasingly exporting their output to other countries. Technology—in the form of computers, the Internet, and mobile phones—enables information to course through the world at lightning speed. News of a breakthrough discovery, a corporate scandal, or the death of a major figure is heard around the world. The good news is lower costs, but the bad news is increased vulnerability. Outsourcing has always had its defenders and its critics. ‘While global interdependence works in everyone’s favor in good times, it rapidly spreads much pain and damage in bad times. We know it when it occurs in nature: It creates havoc in the form of hurricanes, tornados, cyclones, or tsunamis. We experience turbulence in the air from time to time when a pilot asks us to fasten our seat belts. In all these cases, stability and predictability vanish; instead, we are buffeted, bounced, and jabbed by conflicting and relentless forces. And sometimes the turbulence will be so continuous as to plunge the whole economy into a downturn, a recession, or possibly a protracted depression. Economic turbulence creates the same impact on us as turbulence in nature. One moment we hear that Miami has built more condominiums than buyers are buying. Speculators are carrying the cost and having a hard time meeting the payments. We hear of families who have purchased their homes on NINA—"No Income, No Assets”—loans. Now they can’t make their mortgage payments and are facing foreclosures. Banks start realizing that they have deadbeat assets due to securitization and hesitate to make more loans to either customers or other banks. Consumers hear this news and switch from credit-based spending to saving, causing companies that sell automobiles, furniture, and other “postponables” to suffer declining sales. These companies, in turn, announce major layoffs that result in less available consumer purchasing power. Meanwhile, companies slow down their buying from other companies, creating hardship for their suppliers, who in turn, lay off their workers. Companies in these difficult times tend to make across-the-board cuts. They deeply reduce their new product development budgets and marketing budgets, both of which undercut their short-term recovery and long-term future. Consumers, workers, producers, bankers, investors, and other economic actors feel that they are living through an economic hurricane, a maelstrom that is unstoppable and relentless. Hopefully, this turbulence is only short-lived. In the past, it has been. It has not been the normal state of an economy. Yes, economies often do return to “normal” conditions, but in this new era, turbulence at varying levels becomes an essential condition. A particular country may be racked by turbulence, as Iceland experienced in 2008 as its banks moved into bankruptcy. A particular industry—advertising, for example—may be racked by turbulence as companies move more of their money from thirty-second TV commercials into newer media such as websites, emails, blogs, and podcasts. Some markets may be turbulent, such as the housing market or the auto market. Finally, individual companies such as General Motors, Ford, and Chrysler may be buffeted by turbulence while others—Toyota or Honda, for example—may experience less of a plight. The fact that an individual company can be living through conditions of turbulence, and if it lasts long enough, a recession, is underscored in Andy Grove’s well-known book, Only the Paranoid Survive (Currency Doubleday, 1999). As the former CEO of Intel Corporation, Grove had to deal with all kinds of threats to Intel’s preeminent position in the computer chip manufacturing business. It would take just one agile competitor to come out with a superior chip at a lower price to topple Intel. Grove had to live with uncertainty. Intel had to erect an early-warning system that would reveal signs of imminent trouble. It had to create different “what if” scenarios. And it had to preplan different responses to the different scenarios in case they occurred. Grove had to create a system that would insure against risk and respond to uncertainty. We have a name for such a system. All companies must live with risk (which is measurable) and uncertainty (which is unmeasurable). They must build an early-warning system, a scenario construction system, and a quick response system to manage and market during recessions and other turbulent conditions. But our finding is that most companies operate without a chaotics system. Their defenses are scattered and insufficient. Motorola doesn’t have a chaotics system. General Motors doesn’t have one; nor do countless others in the United States, Europe, Asia, and in markets all around the world. Most companies operate on the assumption of a built-in self-restoring equilibrium. Economists built price theory with equilibrium in mind. If oversupply occurs, producers will cut their prices. Sales will increase, thus absorbing the oversupply. Conversely, if a shortage occurs, producers will raise their prices to a level that will balance demand and supply. We postulate that turbulence, and especially heightened turbulence, with its consequent chaos, risk, and uncertainty, is now the normal condition of industries, markets, and companies. Turbulence is the new normality, punctuated by periodic and intermittent spurts of prosperity and downturn—including extended downturns amounting to recession or even depression. And turbulence has two major effects. One is vulnerability, against which companies need defensive armor. The other is opportunity, which needs to be exploited. Bad times are bad for many and good for some. Opportunity occurs when a strong company can take away a competitor’s business or even acquire a weakened competitor at a bargain price. Opportunity is present when your company doesn’t cut critical costs, but all your competitors do. If we are correct, companies need a chaotics system for dealing with uncertainty. We will outline such a system and illustrate it, with cases of companies that have been victimized by chaos resulting from turbulence and many companies that exploited chaos to their advantage. We are hopeful Chaotics will help you lead your company to maneuver, perform, and thrive in the new age we have now entered—The Age of Turbulence. As we began our exploration of turbulence and chaos, it was our stated hope that Chaotics would help business leaders to develop a keener sense of the new challenges that await them and their companies as they begin to realize and take stock of the new normality—heightened turbulence and chaos. To cope with the new environment, in Chapter 1 we identified the many factors creating turbulence that require business leaders to adopt new strategic behaviors if they are to reduce their vulnerabilities and increase their opportunities quickly and systematically. In Chapter 2 we described the normal cut-and-run responses of business executives to periods of recession and turbulence, and how these responses often damage the company’s long-term viability. They need a more thoughtful response based not only on correcting weaknesses but on spotting and seizing new opportunities. In Chapter 3, we showed how many smart and experienced executives continue to be surprised by the events unfolding around them, even though many of these events are visible to the trained eye. By providing guidance in the development of an effective early warning system to detect turbulence in the environment, and constructing yet-foreseen scenarios and strategies, we offered a way to build new and robust organizational muscle to handle the turbulence, including heightened turbulence, with decisiveness and speed. In Chapter 4, we described new behaviors that are required—behaviors that are responsive, robust, and resilient. We discussed how each management function in the organization needs to distinguish between what it can cut or delay, what it can outsource, and what it can increase or accelerate to improve its short-term and long-term performance. Chapter 5 outlined how companies can sharpen their marketing and sales tools as well as their strategies in turbulent times when there’s pressure to cut budgets in these areas. In turbulent times, and most definitely heightened turbulent times, one can argue that the company needs to increase its marketing muscle, not reduce it, if it is to lay the groundwork for a stronger and longer future. and how creating customer advocates is a sure way to generate positive word-of-mouth that will attract and win new customers. If we have achieved our stated goal, Chaotics now provides business leaders with the system and tools to successfully navigate through the uncertain waters that will continue to confront all of their businesses in this new era, The Age of Turbulence.